Lately, I've been giving a lot of love to all of my plaid print items in anticipation of Christmas and, although I do adore plaid, I think one of my favorite patterns of all time is houndstooth! Houndstooth is a great pattern because it's classic but it's also modern as well, because it's a graphic; it's the best of both worlds! I have a lot of houndstooth items, ranging from shoes to skirts to blazers, but the one thing that was missing from my houndstooth collection was a coat! That's why I was so happy to find this houndstooth coat from SheIn, which was also a great deal at only $35! Currently, my coat is sold out, but SheIn has an equally fantastic houndstooth coat here that's even less at only $22! Luckily, this coat arrived just in time for the "cooler" weather here in Los Angeles. Originally, I was thinking of doing an outfit featuring this coat with all black and white, which would be abnormal for me since I adore color so much. 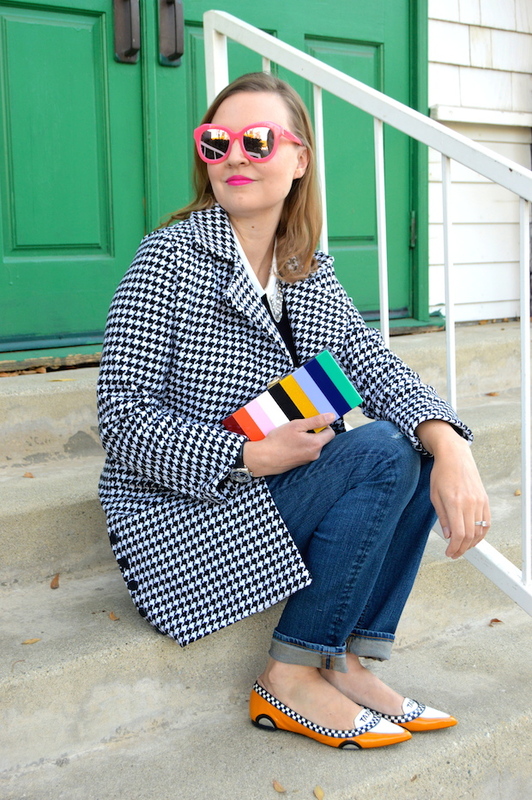 Well, I couldn't quite do the all black and white thing, so I added a few pops of colors in the form of my Kate Spade taxi cab flat shoes, rainbow clutch, and pink sunglasses. 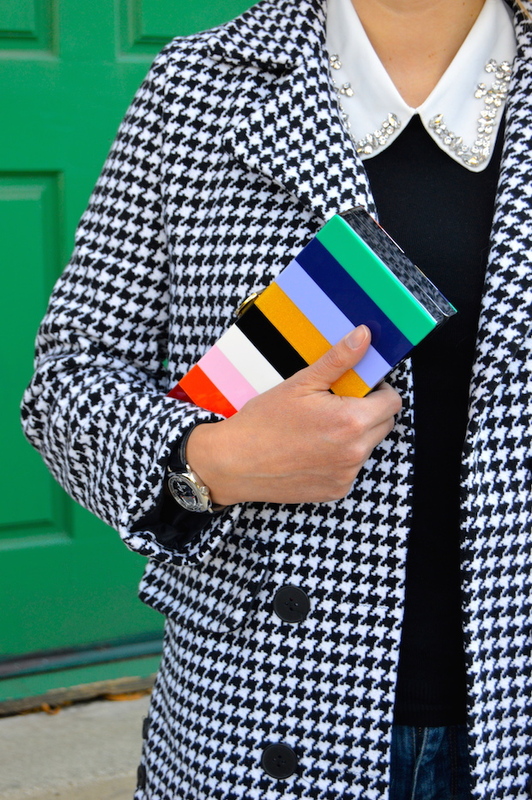 All of these accessories really pop against the black and white of the houndstooth, which just another reason why I adore this print so much, because it's so versatile! I saw those flats on instagram and just thought how cute are those!?! I love your coat and how the black and white detail on the shoes really pops! Oh that is such a cute coat! I love the colourful accessories with it too, so you! :) While I have a lot of printed kimonos for summer, I don't have much cold weather printed outerwear, it's a definite gap in my wardrobe! I've been on the hunt for a cute houndstooth coat this season - love this one! Also loving the pops of color you're showing with your flats and clutch...so cute!